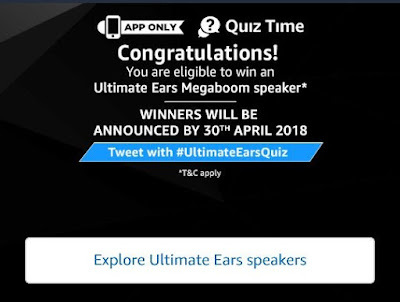 We Are Already Regularly Posting The All Amazon Quiz Time answers & All Amazon App Treasure Hunt items, Before Few Days We Have Posted The Amazon App Quiz, Now Here is Exclusive Chance To Win Ultimate Ears Speaker From Amazon. There are a total of 6 (six) Prize(s) that will be given under this Contest. The Prize will be delivered to the winner on or before 30th May, 2018. Amazon Ultimate Ears Speaker Quiz – How to Participate? 1. The entire range of Ultimate Ears speakers does NOT have which of the following features? 2. The Ultimate Ears Wonderboom speaker can be immersed in a pool. 3. What is the maximum battery life of Ultimate Ears megaboom wireless bluetooth speakers? 4. How many Bluetooth enabled source devices can be paired with Ultimate Ears Wonderboom? 5. Which of these speakers do NOT offer 360 degree sound? 6. The declared winner(s) will be eligible for winning a Ultimate Ears Mega Boom Wireless Mobile Bluetooth Speaker (Black) (hereinafter referred to as “Prize(s)”).